These heavy duty all stainless steel letterplates are sturdier and heavier than any other UAP letterplate, offering a better quality product and making them more resistant. These letterplates have been specifically designed for areas which are within a 25 mile radius of the coast, or within 5 miles of highly populated industrial areas. Made from 316 grade stainless steel, each product in the range has been salt spray tested to ASTM B117 for 2,000 hours, and comes with an industry first LIFETIME coating guarantee, as the products will not pit, rust or corrode no matter what environments you put them in. 2 – It is easier for postmen to navigate letters through the brushes, so you won’t end up receiving crinkled letters anymore. 3 – The brushes stop draughts at the point of entry, making the letterplate draught-proof. Another great feature of all UAP letterplates is that each letterplate flap can open to 180 degrees, meaning that it should not snap, and making letterplate flaps snapping off a thing of the past. Many letterplates in the industry only open to 90 degrees, so when too much force is applied when lifting the flap up, it causes them to snap off. The ultra-flexible springs means that they can withstand thousands of openings without breaking, making them last even longer. Also, an internal water seal also prevents water getting into the door or panel, which stops letters getting wet as they are posted through, and also helps to prevent the flaps from pitting or rusting. in accordance with BS EN 13724:2013. This standardised security test measures the ability of a letterplate to resist attack by fishing; a method of gaining keys through a letterbox using a hook. A letterplate must prevent the accessibility of a hook through it, and this is tested by inserting an aluminium rod, which is 6mm in diameter and 1200mm long, through the letterplate and seeing whether or not it can touch a target of 20mm in diameter, which has been placed on a table on the other side of the door. If the rod is unable to touch the target, then it passes the technical standard, TS 008:2015. If not then a further test is conducted to see if a disc 0.075kg can be retrieved through the door. This machine tests the corrosion resistance of the letterplates. The salt spray cabinet produces a corrosive environment, by releasing a dense saline fog into the chamber which the letterplates are exposed to. This creates an accelerated corrosion of the letterplate and allows us to test how well the letterplate would stand up in harsher environments. The letterplates are tested for differing lengths of time depending on the standard requirements; 480 hours for zamak and aluminium based letterplates where we offer a 5 year inland coating guarantee, and in the case of stainless steel Nanocoast letterplates, we test for 2,000 hours where we offer a LIFETIME coating guarantee anywhere in the country, as the letterplates will not pit or rust. The tensile strength machine tests the resistance of a material to breaking under tension. It is used to see how well the letterplates perform when pressure is applied to them. The letterplates are attached to pieces of timber or plastic to see how well the fixings perform with the letterplate, which gives a more accurate test on the overall letterplate performance. When placed in the all-weather machine, the letterplates are subjected to conditions including high UV exposure using a Xenon Arc Lamp which will accelerate UV degradation and measure how well a letterplate can last in extreme conditions. Other conditions such as rain and extreme heat can be generated by the machine to expose the letterplates to all kinds of environments. This allows us to continually improve the letterplates and make them so they last longer in all kinds of different environments. 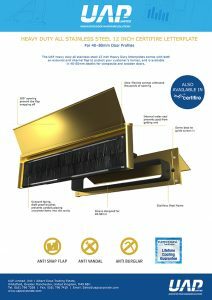 UAP Limited distribute a range of Letterplates in a variety of colours and finishes, Gold, Silver, Stainless Steel, Powder Coated, PVD Gold. As we have no control over the aperture that is cut to take the letterplate, and because the consistency of the door/window/panel thickness is not guaranteed to be perfectly uniform we strongly recommend using a bead of silicone on the rear of the external letterplate half to go all way round the aperture to give extra support to the water seal. Because of the imperfections in the products being fixed to, especially door panels, the only way to guarantee a good water seal is to apply a silicone bead. 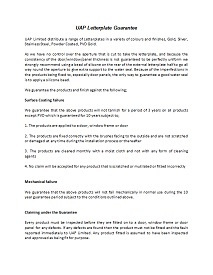 We guarantee that the letterplates will not fail mechanically in normal use during the 10 year guarantee period subject to the conditions outlined above.